Cuba is known for its colonial history, white beaches and superb underwater world with kilometers of reefs. One of the most famous scuba dive destinations in Cuba is Isla de la Juventud or Isle of Youth named after the many students that lived and worked here in the 60s and 70s. 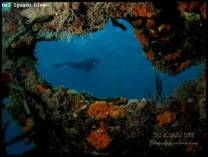 The Canarreos Archipelago just to the east, better known for its largest caye named Cayo Largo, are a set of remote pristine islands often visited by liveaboard divers and therefore offering some of the richest underwater habitats in Cuba. With a shore line of thousand's of kilometers, the tropical Caribbean Sea in the south and the warm Gulf of Mexico in the east, Cuba is provided with a wide and diverse set of dive sites and inhabitants. 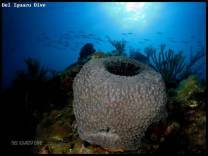 Other popular diving locations are Maria la Gorda, the Bahia de Cochinos (world renowned as the Bay of Pigs where the Americans tried to attack Cuba in 1961), Santa Lucia, Cayo Coco and the Jardines de la Reina. Cuba is one of the last Communistic regimes in the world. Its capital Havana is a city with picturesque and colorful houses, American veteran cars from the fifties, Cuban music on every street and delicious food. Some very good examples of Spanish colonial architecture are found (Real Fuerza Fort). Havana Vieja has been part of UNESCO since 1982 and is a great place to stroll around. You can visit the Museo de la Revolucion or you can go shopping around Obispo. In the west of Cuba is the province Pinar del Rio with Viñales, known for its tobacco plantages and beautiful surroundings. To the east of Havana you can find the Sierra de Escambray near Cienfuegos and Trinidad. Santa Clara is where you can find the Mausoleum of Che Guevara, still one of the touristic highlights of the Cuban revolution in the late '50s. In Camagüey you can find white plastered houses, Barok churches and narrow curling streets. Santiago de Cuba in the southeast is known for its Cuban music and Varadero is said to have some of the whitest beaches in the world. Scuba diving is possible all year, although September and October are prone to hurricanes and November is the best month to spot Whale Sharks. There are a few wrecks, several great drop-offs and innumerable fantastic coral gardens. It is a great holiday to combine culture, paradise and diving.